I wanted to create wedding inspiration inspired by my branding. I had complete creative control for this project and it was a lot of fun for me! This was also my debut of planning, designing, styling florals and rentals for a shoot! It was a lot of work but it felt right and like I was in my element. The team of vendors that I got to work with did an incredible job and truly helped me bring my vision to life. The photos from Emily Katharine absolutely blew me away and I hope you enjoy them! The design board I created for the shoot. I wanted modern elements like the geometric terrariums and metallic accents balanced with older elements like the exposed brick and historic details that Ybor City and CL Space offers. I tend to always have romantic and whimsical elements in my design without trying and the flowers really represented that for me. I loved how beautiful but effortless Jenny's look was. The dress had unique details like the intricate beading and open back but it wasn't over the top with lots of poofy layers or fuss. I loved that about it! The invitations from Wedding Paper Divas were the first detail I started with. I saw them and had to have them! The movement in the colors and the metallic gold elements totally had me. Our models were Jenny and Mike who just celebrated their 2nd wedding anniversary. Jenny and I volunteer together through The Junior League of Tampa and she is just the sweetest. She is also the owner of Bar Method Tampa and if you haven't checked it out yet I highly recommend it! I can never get enough of Ybor City's charm. All the brick and cobblestone gives me all the heart eyes! 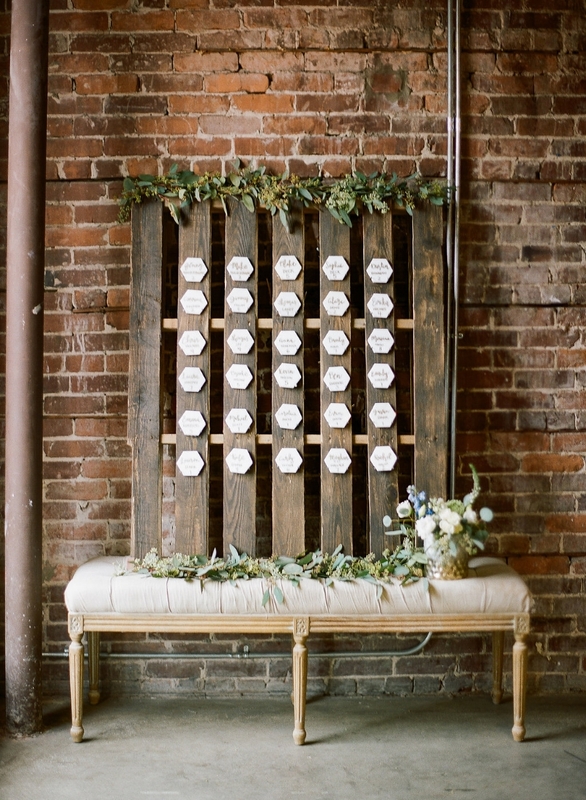 The seating chart is the easiest way to incorporate your personality into your wedding. For this I had my husband stain and add nails to a palette. It played off the industrial look of CL Space. I hand lettered marble tiles in metallic gold with guest names and table number. I squealed when Trudy delivered this cake. It reminded me so much of my logo and she totally did that unintentionally! She created this design just by looking off of my design board. I added the florals and terrarium and it was the perfect piece to this design. You can see this inspiration shoot featured on Every Last Detail.